With up to 4,800 W the K2 is the « smallest » amplifier in K Series. Built on the same technologies and features as present in the bigger models, it makes a full-fledged member of the amplifier line that changed the face and direction of the professional audio amplification market. Only 8kg/17.6lbs light, the K2 is the ideal companion for where space, weight, and uncompromised sound quality matter. Per Step-up card a K2 can be upgraded to become a K3 – more power without replacing the entire amplifier. 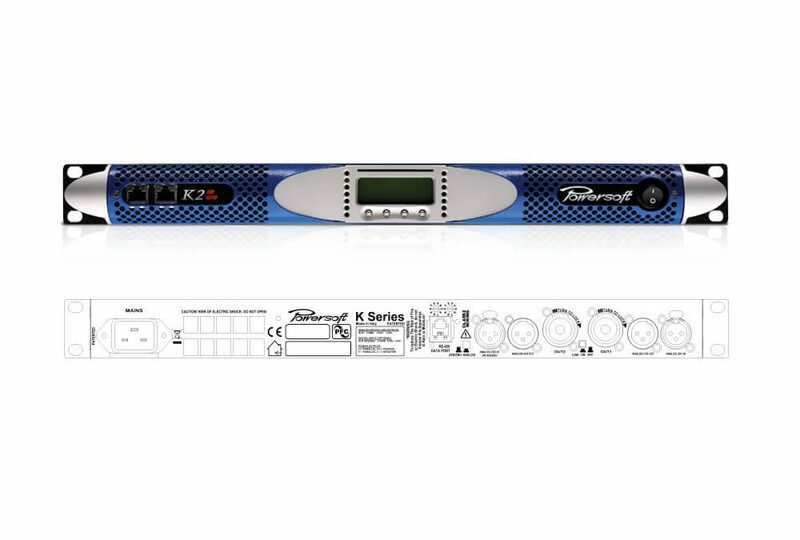 Fully digitally controlled and with a serial PC communication port as standard, the K2 is also available with KDSP board and KAESOP Ethernet/AES3 interface: the K2 DSP+AESOP amounts to a fully integrated, highly sophisticated yet easy to use power source including state-of-the-art sound shaping and system management capabilities, remotely controllable via Powersoft’s Armonía Pro Audio Suite™ (Interface available for MediaMatrix, Crestron, AMX, Q-SYS control and monitoring systems).